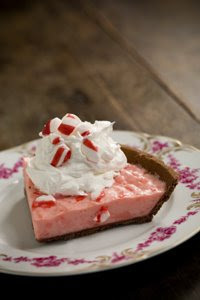 I made up my own recipe on this one as my husband and I have been craving a peppermint pie for some time. I took the idea from the key lime pie I currently have in my blog, and I adapted it. Mix coolwhip, sweetened condensed milk, and peppermint extract in a large bowl. Add red food coloring if desired. Pour mixture into pie crust and refrigerate at least 2-3 hours. Top with whip cream and crushed candy canes. Conveniently I had the Italian bread crumbs AND the dried ranch dressing mix...so this was perfect for us. So good! My only suggestion would be to watch them carefully in the skillet. It went much faster than the 5 minutes the recipe calls for. Place the bread crumbs in a bowl. In a shallow dish, mix the dressing mix and oil to form a paste. 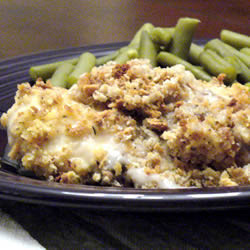 Coat the tilapia fillets with the paste, then dredge in the bread crumbs to lightly coat. Melt the butter in a skillet over medium heat. 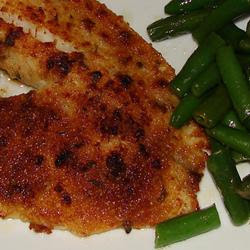 Place the fillets in the skillet, and cook 5 minutes on each side, or until golden brown and easily flaked with a fork. I found this recipe stashed away in some files on my computer. We've never tried it until now, and I'm so glad we did! Obviously you can pick your own toppings, we strayed a bit from the recipe, but I'll share exactly what the recipe says and then you can go from there! 1. Heat oven to 400 degrees. 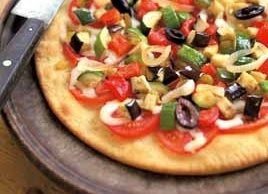 Lightly brush tortilla with olive oil. 2. Place on baking sheet and bake for 5 minutes on each side or until crisp and golden brown. 3. Remove from oven and reduce heat to 350 degrees. Top each tortilla with half the tomato, basil, onion, olives, and shredded cheese. 4. Sprinkle with pepper to taste. Bake at 350 degrees for 5 minutes or until cheese melts. P.S. I cut this recipe in half for just the 2 of us, but am putting the full recipe on here. Lightly spray crock-pot with cooking spray. Place chicken breasts in bottom of crock-pot. Top with cheese. Combine soup and milk, stirring well. Spoon soup mixture over cheese; sprinkle with stuffing mix. Drizzle melted butter over stuffing mix. Cook on low in crock pot for 4 to 6 hours or until juices run clear. 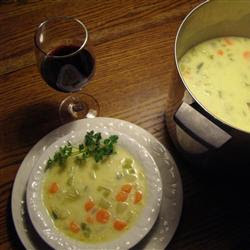 I got this recipe off of allrecipes.com and thought we'd give it a try this weekend since it's been so cold and we're in for a small winter storm. Nothing helps make a cold winter day more tolerable than a nice bowl of soup! In a large slow cooker, mix soup and water. Add onions, vegetables, and garlic, salt, and pepper to taste, and mix. Add cheese and mix. Simmer approximately 2 hours or until soup is creamy and cheese is melted.